We specialize in leather that is the ultimate in both sophistication and style for domestic and import cars, trucks, and sport utility vehicles. We can customize your vehicle to your personal touch. Katzkin gives you the freedom to take your vehicle's interior in any direction, and leave boring way behind. Visit Katzkin's Interior Selector to find the interior to match you. 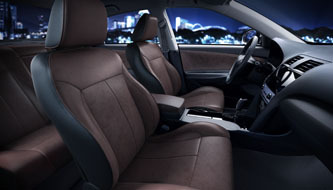 The look, the feel, the smell of a premium, factory-quality, leather trimmed interior is now an affordable luxury! You don’t have to pay thousands of dollars for the entire factory upgrade package, when all you really want is the leather. See the difference for yourself. Just used the Interior Selector and enter your make and model. Leather or cloth? This one's easy. Here’s your chance to make a statement. Our professionally designed, custom options will make your new interior pop! We’ve been perfecting our craft for 25 years, and these choices reflect the combinations we know will transform your car into something unique and special. Use the Interior Selector now and give it a test drive!